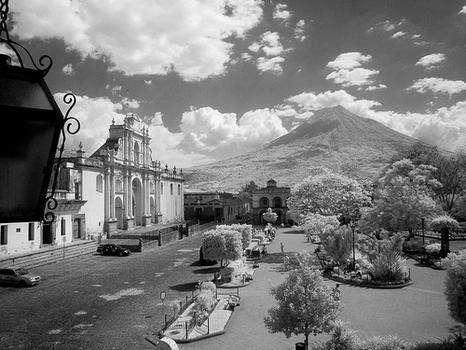 Parque Central is the heart of the UNESCO World Heritage site of Antigua Guatemala, the central square with historical buildings, shops and restaurants where locals and tourists descend for fun and entertainment. Parque Central is the heart of the UNESCO World Heritage site of Antigua Guatemala, the central square with historical buildings, shops and restaurants where locals and tourists descend for fun and entertainment. The square is also known as Plaza Mayor, Plaza Real and Plaza de Armas. At the centre of the square is the famous Fuente de las Sirenas (Fountain of the Sirens), a 1936 reconstruction of the original 1738 version designed by Diego de Porres. Important buildings around the square include the ●Palacio del Ayuntamentio also known as Casa de Cabildo – the Municipal Office with the Museo de Santiago which displays a collection of weapons and the Museo del Libro Antiguo or Antique Book Museum which displays books from colonial times, ●Palacio de los Capitanes Generales - the headquarters of the Guatemala Institute of Tourism, the Antigua Tourism Association, National Police and the Sacatepquez Department government, and ●Antigua Guatemala Cathedral. The Porta del Comercio has shops and cafes, and the Casa del Jade is where you can buy precious Guatemalan Jade jewelry and items. Off to the side of the square is the landmark Arco de Santa Catalina. The Parque Central is a bustling place, with musicians and jugglers busking their way through the day, hawkers selling handicrafts and wares, and mariachi bands entertaining the public.